pathway by releasing E2F. The viral oncogenes are involved in many other activities including blockade of apoptosis, activation of telomerase and myc expression, and the suppression of innate (e.g., interferon signaling) and adaptive (e.g., downregulation of major histocompatability [MHC] class I) antiviral immune responses. The action of these onco-genes and the upregulation of E1 and E2 as the infected basal keratinocytes divide and leave the basement membrane and provide for overreplication of the viral genome. This overreplication increases the number of viral episomes from ~102/infected basal cell to 104-105/cell ready for packaging inside the capsid. 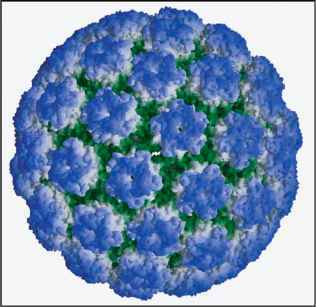 HPV E1AE4 protein (henceforth referred to E4) is the most abundantly expressed viral protein in HPV-infected epithelia, formed by RNA splicing of sequences encoding the first five amino acids of E1 with the E4 open reading frame (23). E4 is expressed later than E1, E2, E5, E6, and E7, but earlier than the capsid proteins and is believed to facilitate viral message translation and breakdown of the keratin networks to allow for virus release. The minor capsid protein L2 is then expressed and targets to a subnuclear domain, ND-10. Therein it recruits the major capsid protein L1 and the histone-bound viral genome, which then assembles to form infectious virions (Fig. 3). There is no evidence for active virion export; rather, as the infected squames slough from the surface of the lesion, they are likely to disintegrate to release the virion particles. It is possible that the disintegration of the keratin networks by E4 facilitates dissemination of the virions, although this remains unproven.